After making just one start following his return from the DL, Houston Astros starter Lance McCullers Jr. is back on the shelf. The Astros have scratched McCullers from his scheduled start on Wednesday because of what manager A.J. Hinch calls “arm fatigue.” Mike Fiers will start in his place against the Angels. McCullers made his return from the DL last Wednesday. He gave up three runs on four hits in 5.1 innings against the Mariners, although he only threw 76 pitches. It was his first start in more than a month after McCullers went on the DL because of back discomfort. It was the second time this season that back trouble forced him to the DL. The Astros were hopeful that an extended stay on the DL this time around would put McCullers in position to be healthy for the stretch run. However, it appears his arm is not quite back in shape. While playing catch before Tuesday’s game, McCullers reported arm fatigue to team trainers. The Astros promptly scratched him from Wednesday’s start. McCullers says that the long layoff while he was on the DL made him ill-prepared to pitch at the major league level. He likened the situation to something that’s common early in spring training and doesn’t appear to be too concerned with the setback. Hinch says that as long as McCullers isn’t concerned about his arm fatigue that he isn’t going to worry too much about it either. Before his back became an issue, McCullers was having an outstanding season. In 16 starts prior to the all-star break, he was 7-2 with a 3.05 ERA. The Astros were hopeful that if he rested his back, he would return to his early-season form by the start of the playoffs. But with his scratch from Wednesday’s start, McCullers may only get two or three more starts to get his arm in shape before the postseason. The good news for the Astros is that McCullers is more luxury than necessity at this point. 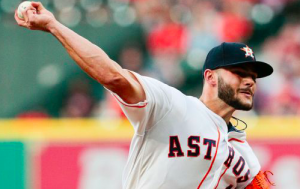 With Justin Verlander and Dallas Keuchel at the top of the rotation and Collin McHugh and Charlie Morton both having strong seasons, the Astros could get by in the postseason without McCullers in their rotation. However, a fully healthy McCullers would at least be the third best pitcher in Houston’s rotation. He could also be a real asset in the playoffs. The Astros remain hopeful that McCullers will get past his back problems and be a part of their rotation in the playoffs. But with this recent setback, time is now a factor in McCullers’ comeback. A.J. Hinch, Charlie Morton, Collin McHugh, Dallas Keuchel, Houston Astros, Justin Verlander, Lance McCullers Jr.